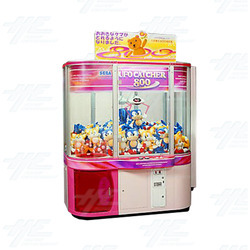 Sega UFO Catcher 800 is a one player crane machine with dual-shoveled claw heads that model the look of a retro UFO. The machine has two buttons - one marked with a forward arrow, and one with a right arrow. The crane starts near the front, left side of the machine and the user presses first the forward button to move the crane towards the back of the cabinet. Once the button is released the crane stops moving and the button cannot be used again, thus requiring the user to judge depth accurately in one attempt. After this, the right button becomes active in a similar way and as soon as it is released, the crane drops to a certain depth and then raises, closing its claw on the way and returning to the drop hatch in the front left corner. In general, while getting the claw to pick up a prize is relatively easy, having the claw hold the prize long enough to bring it to the opening is harder. Operators of the machine can tweak the claw or other settings, or change the prizes, to make it less or more difficult. The claws are usually engineered to have a low probability of a successful grab for casual players, though skilled players have a considerably higher probability of success. The machine has two buttons - one marked with a forward arrow, and one with a right arrow. The crane starts near the front, left side of the machine and the user presses first the forward button to move the crane towards the back of the cabinet. Once the button is released the crane stops moving and the button cannot be used again, thus requiring the user to judge depth accurately in one attempt. After this, the right button becomes active in a similar way and as soon as it is released, the crane drops to a certain depth and then raises, closing its claw on the way and returning to the drop hatch in the front left corner. In general, while getting the claw to pick up a prize is relatively easy, having the claw hold the prize long enough to bring it to the opening is harder. Operators of the machine can tweak the claw or other settings, or change the prizes, to make it less or more difficult. The claws are usually engineered to have a low probability of a successful grab for casual players, though skilled players have a considerably higher probability of success.